In a burgeoning world of people with ever-decreasing space, micro container gardening has found a rapidly growing niche. Good things come in small packages as the saying goes, and urban micro gardening is no exception. So what is micro gardening and what are some useful micro gardening tips to get you started? Read on to learn more. Indoor or urban micro container gardening is the practice of cultivating vegetables, herbs, roots and tubers in small spaces. These gardening spaces might be balconies, small yards, patios, or rooftops which make use of containers – anything from plastic-lined wooden crates, old car tires, plastic buckets, trash cans, and wooden pallets to purchased “nourishmats” and polypropylene bags. Small scale hydroponic systems are another option as well as aeroponics, growing plants in hanging containers with little to no soil, or aquaponics, which is growing plants (or fish) directly in water. What are the benefits of urban micro container gardens? They combine a technique of horticultural production with environmentally friendly technology suited for city dwellers. These include rainwater harvesting and household waste management. Micro gardening can work for just about anyone with a small space and be as simple and inexpensive or more complex and costly as you wish. Research by the U.N. Food and Agricultural Organization shows that a well-tended 11-square foot micro garden can produce as much as 200 tomatoes a year, 36 heads of lettuce every 60 days, 10 cabbages every 90 days and a whopping 100 onions every 120 days! More costly irrigation drip systems can be installed amongst a micro garden, or rainwater can be channeled through a system of gutters and pipes into a cistern or directly off the eaves of the roof. 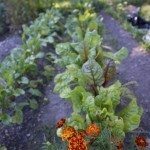 The internet is rife with both DIY micro garden plans as well as a host of products available for purchase that can help get your own micro garden going. Remember, your tiny Eden doesn’t have to cost a lot. Think outside the box and look for salvageable items that can be repurposed. Many industrial districts have free pallets, yours for the asking. These make wonderful “walls” of herbs that double as miniature edible gardens as well as colorful, sweet smelling partitions or privacy screens on a tiny balcony. Also, look into the extensive selection of microgreens such as baby spinach, chard and lettuces that are perfect in an outdoor or indoor micro garden. Think about growing up to maximize space too. For instance, many squash plants can be trained to grow up rather than out. Use trellises, lines, tepees made from bamboo or even rebar or PVC pipe, old gates…whatever you can think of that will act as a support and can be anchored sturdily. Even corn can be grown in a micro garden setting. Yes, corn will grow in a container. Ours is doing fantastically well!